We certainly have the unconscious that we deserve, an unconscious for specialists, ready-made for an institutionalized discourse. I would rather see it as something that wraps itself around us in everyday objects, something that is involved with day-to-day problems, with the world outside. It would be the possible itself, open to the socius, to the cosmos . . . In his seminal solo-authored work The Machinic Unconscious (originally published in French in 1979), Félix Guattari lays the groundwork for a general pragmatics capable of resisting the semiotic enslavement of subjectivity. Concluding that psychoanalytic theory had become part and parcel of a repressive, capitalist social order, Guattari here outlines a schizoanalytic theory to undo its capitalist structure and set the discipline back on its feet. Combining theoretical research from fields as diverse as cybernetics, semiotics, ethnology, and ethology, Guattari reintroduces into psychoanalysis a “polemical” dimension, at once transhuman, transsexual, and transcosmic, that brings out the social and political—the “machinic”—potential of the unconscious. To illustrate his theory, Guattari turns to literature and analyzes the various modes of subjectivization and semiotization at work in Proust’s In Search of Lost Time, examining the novel as if he were undertaking a scientific exploration in the style of Freud or Newton. Casting Proust’s figures as abstract (“hyper-deterritorialized”) mental objects, Guattari maps the separation between literature and science, elaborating along the way such major Deleuze-Guattarian concepts as “faciality” and “refrain,” which would be unpacked in their subsequent A Thousand Plateaus: Capitalism and Schizophrenia. 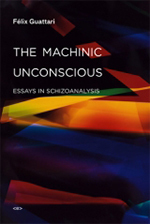 Never before available in English, The Machinic Unconscious has for too long been the missing chapter from Deleuze and Guattari’s Anti-Oedipus project: the most important political extension of May 1968 and one of the most important philosophical contributions of the twentieth century.